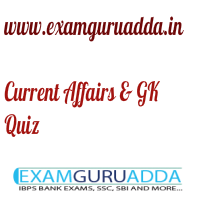 Dear Readers Examguruadda.in presents Current Affairs quiz of 17-18th December 2016 that cover important current affair events. Current Affairs quiz for IBPS PO,clerk, RRB-Po,Clerk, SBI, NIACL,Railways and SSC Exams. 1. Who was appointed Chief of Indian Army ? 2. Who was appointed as the new chief of Intelligence Bureau (IB)? 3. Who was appointed as Chief of the Air Staff of the Indian Air Force (IAF)? 4. Who was appointed as new chief of Research and Analysis Wing (RAW)? 5. Which states has attained 100% Aadhaar saturation in India? 6. “State Bank MobiCash” digital wallet has been launched by State Bank of India (SBI) in partnership with which telecom company? 7. Who has won the Miss World 2016 competition ? 8. Which country’s team has won the 2016 Men’s Junior Hockey World Cup tournament? 9. The International Migrants Day (IMD) is observed on which date? 10. Which Brazilian site accorded UNESCO World Heritage site status?